THE NATIONAL ASSET Management Agency (Nama) has announced an ambitious funding plan that will see €1.9 billion put into in Dublin’s Docklands. The funding announced today would see the agency fund the construction of 20,000 homes across the country, as well as 2,000 apartments and 3.8 million square feet of commercial space in Dublin’s Docklands. That commercial space would be twice the size of Dublin’s IFSC. The developments will be carried out on 15 sites on both sides of the river Liffey. The housing plan will require total funding of €5.6 billion with peak funding expected to be €1.8 billion. A total of 78% of the building will be in Dublin city and county, while 93% will be in the Greater Dublin area. The balance will be built in “areas of strong demand”. Nama says it will recycle the proceeds of sales to fund the building of viable projects. Nama is also to seek joint venture partners on the plans. 13,200 units have already identified as commercially viable at this point by Nama, with a focus on three- and four-bed starter homes. The funding will see 30,000 construction jobs created at its peak, Nama says. 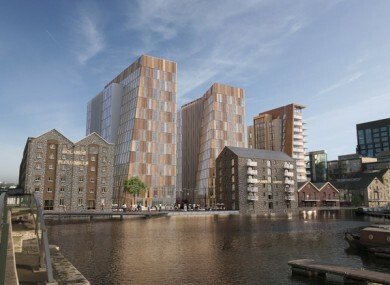 €170 million of the money will go to the Boland’s Quay project in Dublin. The project, Nama today announced, is expected to be finished by the end of 2018. Receiver Mark Reynolds of Savills says the plan, which will have two landmark office buildings and 41 apartments, is “full steam ahead”. Email “Nama is putting €1.9 billion into building in Dublin's Docklands”. Feedback on “Nama is putting €1.9 billion into building in Dublin's Docklands”.